For this Iron Craft challenge we were to make something using light or pertaining to light. I had an idea for a modern wreath for my mantel. 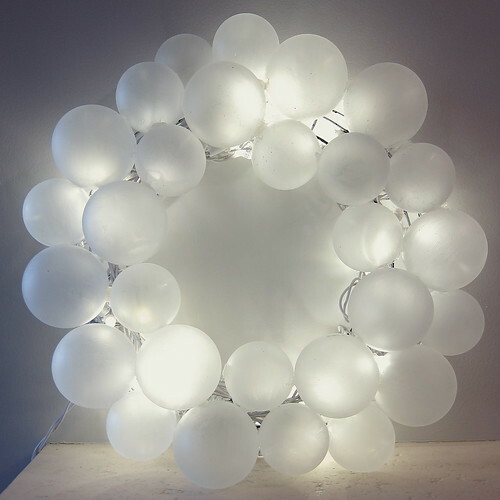 The original idea was to cover a metal wreath form with clear glass balls and light it up from behind with Christmas lights. The more I thought about it, the more tweaking the idea needed. My wreath form was green (I should have bought a silver or white one. I did paint my white but a lot of the paint scraped off while I was working with it.) and I didn’t want the green showing through the clear glass balls. Plus, all the light cord was going to show through and I know never be neat enough for me. 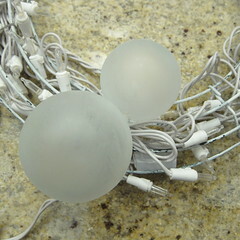 The solution was to find frosted balls that would still let light through and yet hide the works behind. I love it. It’s clean and modern, just what I wanted. Plus, surprisingly easier to make than I thought, once I got the hang of it. 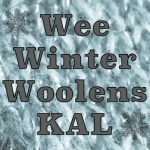 Some notes on the Frost Etching Effect. It gave just the slightly opaque look I was going for, but it took a little trial and error to get it right. You can use it as is or tint it with acrylic paint. On its own it was very light, I found a little paint helped a lot, but if you use too much it’ll just look like paint not frost. I tried both white and silver paint and found the silver gave the nicest result. (I may just have gone to heavy with the white.) Then the trick was getting it on the glass balls. I tried sponges, dabbers, paintbrushes and a soft cloth, all gave pretty streaky coverage. Finally, I tried my finger, that was the way to go. It will look a little streaky especially on the first coat, but a second coat will dry pretty smoothly. The trick is to make sure to get a thin, even coat and let it dry completely before doing the second. Here is the difference between one coat and two. You can see coat two is less streaky and less see-through. Because you are not really etching the glass, this frosting can scrape off especially when rubbing two frosting balls together. So don’t mess around with them too much when gluing them on the wreath form. String of white Christmas light (try to get a string with a white cord). I used a string of 60. 1. (If you have bought pre-frosted balls you can skip to step 2.) 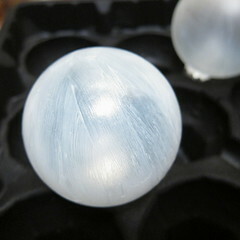 Frost the balls – Mix about 2 teaspoons or so of the Frost Etching Effect with a few drops of the acrylic paint. I only made a little at a time because I didn’t want it to dry out. It goes a long way since you are doing such thin coats. You really want just a little of the color or it get looks just like paint when you use it, not frost. Stir together. Coat the balls with a thin coat of the frost/paint using your finger. Let the first coat completely dry. It is important to let it dry completely or you”ll just wipe it off when you apply the second coat. Apply a thin second coat and let dry again. You can add more coats it you want, but two seemed good enough to not see through. 2. 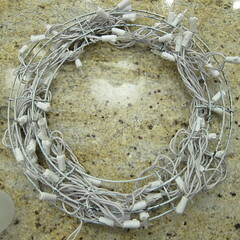 Put the lights in the wreath frame – I did this by securing the ends of the light sting to the frame with a twist tie. Then I just filled in the rest of the frame, tying it in a few places. 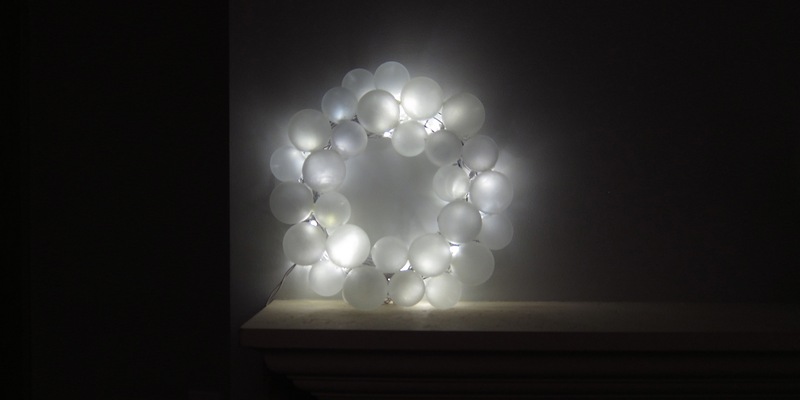 The frame is curved and you are putting the lights inside the curve. 3. 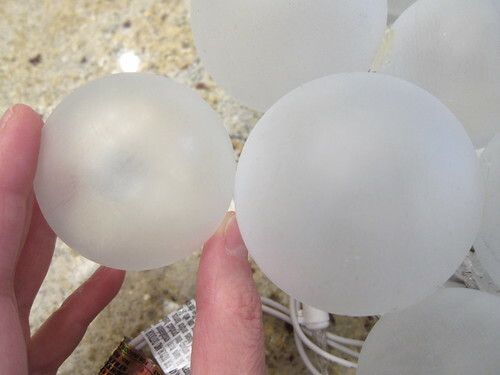 Hot glue the balls to the frame – Take the metal ends off the balls if you haven’t already. Work around the frame mixing up the size of the balls. 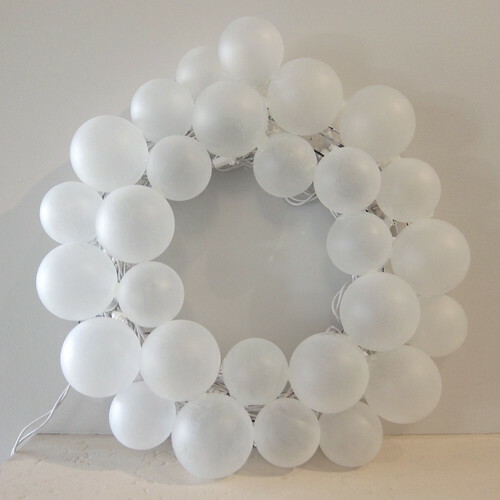 Glue the balls to the wreath form and each other. Be generous with the glue. 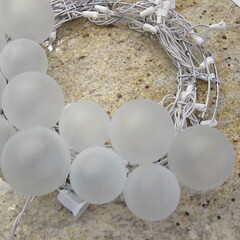 Be careful not to touch the hot tip of the glue gun to the glass balls, I had one break from the heat. Fill the whole wreath and you are done. Hang and enjoy! What a great idea. So modern and stylish. Well done, as always. Really great project. That is so beautiful.! Nice Job! Your Frosted Christmas Wreath very beautiful..
Could you frost the balls from the inside? I would think swirling the paint or frost medium would make a nice even coat. 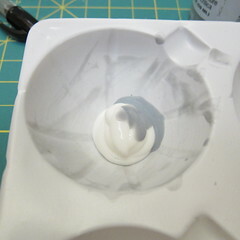 The frost medium was pretty thick, so I don’t think it would swirl very easily. You could try watering it down & see how that works. Wow! Wow! and Wow! 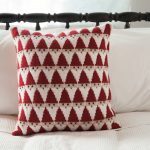 Love this ideal.It looks great and I can’t wait to find all the supplies and try this. Thank you! You can but frosted glass spray paint at Home Depot. Your idea is great it’s beautiful. I was wondering if instead of hot gluing the bulbs..if you could leave the toppers on and tie them to the wire wreath with the same results? You could try, my worry would be it would be hard to get the balls to stay tight together. Also, I would think they would move around a bit if they were tied on. Glued they really stay in place. If you try it let us know. I am so making this right now. Finally found white lights with white strand. Can’t wait to see it done. I have a couple questions: 1. you took the silver part out of the balls and did not use it? Next: 2 you didn’t put any of the ball on the lights inside right, just on top of? Yes, I did not use the silver or hanging part of the balls, I wanted the wreath to be all white. No, I didn’t put any light into the balls themselves. Since the lights were wrapped around the wreath form it was easier not to worry about trying to line those up & it really didn’t need it. If you have trouble finding frosted balls, why not try ping bong balls. Just put a small X on the printed side of the balls with a knife or exacto knife. You definitely could though they are smaller than the balls I used and also only in one size. love the wreath. I think I will try using ping pong balls from the $ store. 1$ for a package of 8. The only thing I’d question about this: I used hot glue to repair a lampshade, with the lamp on, the glue would melt. Will this not happen when the lights are on, turning the balls loose? I haven’t had the problem at all, Perhaps the Christmas lights don’t get hot enough especially if you use LEDs. You could probably also use another glue that will hold glass together quickly and securely like a silicone.